Dedication, passion, obsession—for serious endurance athletes, coaches, duathletes, and triathletes, the quest for improvement never ends. Knowing they can shave time from the previous performance, they seek out the latest in research and training techniques. In Championship Triathlon Training, renowned experts George Dallam and Steven Jonas provide you with the same advanced conditioning concepts and programming used by today’s elite triathletes. Develop more efficient movement patterns for increased performance potential and reduced injury. Complete with sample programs for each triathlon distance, technique analysis, training- and race-specific fueling strategies, and tips for motivation, focus, and goal setting, Championship Triathlon Training will optimize your training and maximize your results. George Dallam, PhD, is the longtime coach of Hunter Kemper, the No. 1-ranked triathlete in the ITU World Cup during 2005 and most of 2006. He is the founding member of the National Coaching Commission of USA Triathlon, the sport's national governing body, and was USA Triathlon's first national team coach. In 2004 he was a finalist for the Doc Counsilman Award for Science in Coaching category of the United States Olympic Committee's Coach of the Year Award. In 2005 he was USA Triathlon's Elite Coach of the Year. Dallam is an associate professor of exercise science and health promotion at Colorado State University at Pueblo. As a sport scientist he has authored and coauthored numerous scientific papers relating to triathlon. During his career at CSU-Pueblo, he has received each of the university-wide awards for teaching, scholarship, and service, becoming the only faculty member in the history of the institution to receive all three awards. During his 16-year triathlon coaching career, Dallam has served as a personal coach to several elite triathletes, including Amanda Stevens, Marcel Vifian, Callahan Hatfield, Michael Smedley, and Ryan Bickerstaff. As the USA Triathlon national team coach, he also served as the Olympic Training Center resident and collegiate programs coach for Olympians Nick Radkewich and Susan Williams as well as perennial international stars Laura Reback, Becky Lavelle, and Doug Friman. Before focusing on triathlon, he coached at various levels in swimming, water polo, and cross country. He resides in Colorado Springs. Steven Jonas, MD, MPH, MS, FNYAS, has been a regular columnist and contributor to The East Coast Triathlete, Triathlon Today, Triathlon Times, and American TRI. Since 2006, he has written a column titled “Ordinary Mortals: Talking Triathlon with Steve Jonas” for USA Triathlon Life. 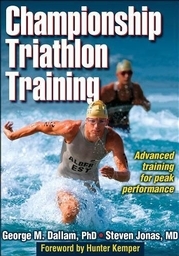 He is the author of Triathloning for Ordinary Mortals and The Essential Triathlete. He also currently serves as editor in chief for American Medical Athletic Association Journal and has been a member of the editorial board of ACSM's Health & Fitness Journal since 1999. Jonas is a professor of preventive medicine in the School of Medicine at Stony Brook University in New York. As author, coauthor, editor, and coeditor, he has published more than 25 books and 135 academic papers on health policy, health promotion, disease prevention, and fitness and exercise. The year 2007 marked Jonas' 25th season as a recreational triathlete. He has competed in over 185 multisport races, including 115 triathlons, at distances up to the Ironman. He is also a certified professional ski instructor. Jonas resides in Port Jefferson, New York. "In Championship Triathlon Training, George Dallam and Steven Jonas combine the latest research and cutting-edge programming to create the definitive training resource for serious triathletes." "Championship Triathlon Training covers all of the important aspects of triathlon, including those that are often overlooked: strength, nutrition, speed, technique, and mental training. I highly recommend it." "By combining experience and science, George Dallam has produced the world's top-ranked male triathlete. With coauthor Steven Jonas, a regular triathlon columnist, George shares his knowledge in Championship Triathlon Training so that you can benefit from the sport's best."